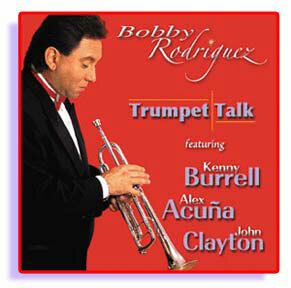 Trumpet Talk is what I call my style of playing. My music has always been Jazz with a Latin feel and now I've been blessed with the opportunity to put the two sides of what I love on one recording with the help of the best musicians in the world. The fun and freedom of being able to improvise in a Jazz context or over a Latin rhythm section is my greatest pleasure! Now you'll experience the Bobby side and the Rodriguez side of my music. What a thrill to have Kenny Burrell on this recording. He brings class, dignity and the history of Jazz music. The only drummer considered for this project was the great Be-Bop & LatinJazz master, Alex Acuña. His positive attitude, tremendous energy and friendship made this session possible. John Clayton brought his world class musicianship and a complete concern for detail and time. And to be able to present 17 year old Gerald Clayton on his first professional recording and with his father is a dream. Plus I present to you a taste of the outstanding bass playing of Joel Ciulla, and the brilliant talents of my wife, Yvonne whom you'll hear and see throughout this CD. Most of my past recordings have been based on the great music of other artists but this time out I wanted to bring you everything I have inside me. With my spirit and love for what I do and my hopes and dreams for a better and safe world, I present to you "Trumpet Talk"a recording to bring us closer together.